The north end of the locoshed has had some modification. While the office window is original, the upper floor is a later addition. The corner of the building has also been changed to make it easier to get coaches in and out. The original features of the building can be seen in this view. The building is currently used as a motor coach repair facility. The original Redhill Station which was built in 1841 by the London & Brighton Railway is located at Hockley Business Park. The Locomotive shed is scheduled for demolition in mid 2018. It is one of the few remaining railway buildings of that age and type. The the original planning permission was refused by Reigate & Banstead Council, but the demolition was approved on appeal and against the wishes of the town. This historically important building has a number of important architectural features and is one of the earliest buildings in Redhill and deserves to be preserved. We are therefore appealing for its retention. The London & Brighton Railway became the London, Brighton & South Coast Railway in 1846 when it merged with the London & Croydon Railway. 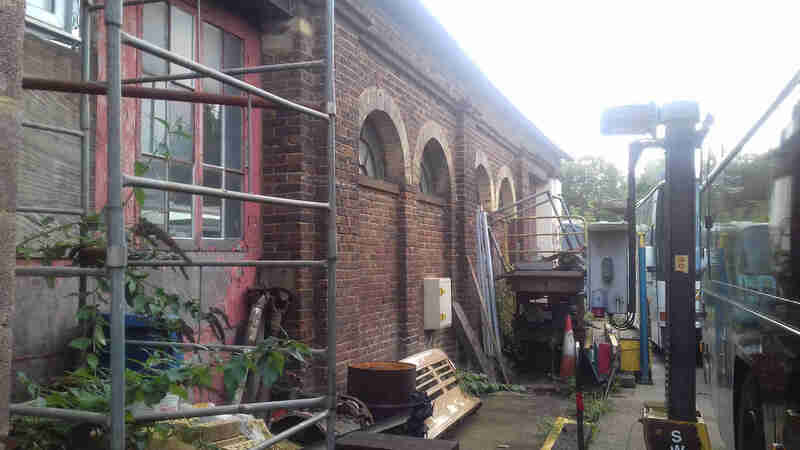 Very few original London & Brighton Railway buildings are known to exist. The former station is nearly a kilometre to the south of the present Redhill Station. Photography of the building is difficult with old motor coaches parked near the western side, the present railway along the eastern side and the southern side has later outbuildings on it. The photos opposite show the present state of the building. Hover the cursor over each photo for an explanation of each. Redhill is a railway town and the potential demolition of the earliest railway building in the Borough amounts to an act of heritage vandalism. The developers are Nordhus Properties. This building is part of the proposed Redhill Heritage Trail. You can read more about the former Redhill Station in John Capon's article. At the start of this campaign, we were unsure of the date of construction of this building. We have been contacted by Mr John Minnis, the architectural steward of the Brighton Circle, the historical society for the LB&SCR, author of the 'The Railway Goods Shed and Warehouse in England' (Historic England 2016) and recently retired as a Senior Investigator with Historic England. He has carried out extensive research on LB&SCR buildings at the National Archives and in the Southern Region plans archive formerly at Waterloo. The building was not part of the original station but was built by the London, Brighton & South Coast railway as a goods warehouse authorised at the LB&SCR board meeting of 12 October 1854 and a tender from the builder J Fabian of £344 for its construction was accepted on 15 March 1855. It was similar to the warehouse at Hassocks where a tender for £336 was accepted on 7 September 1853. 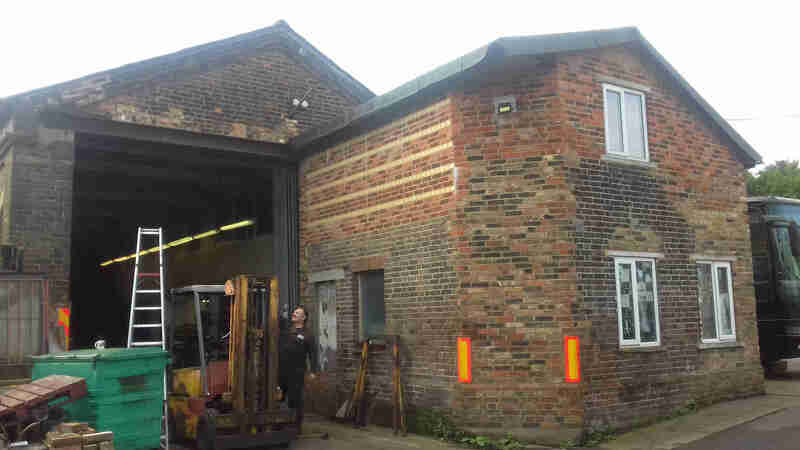 Mr Minnis is doubtful that the warehouse was used as an engine shed but smoke marks inside the building and local knowledge from the present tenants would imply that engines had been shedded there. Also on the site is a stables. Mr Minnis gives the following information: the stables (3 stall stable) was authorised by the Engineering Committee of the Board on 16 December 1890, and a tender for £345 by James Longley, approved 16 December 1890). It is a rare survivor of railway stabling and forms an interesting group with the warehouse and nearby railway cottages (authorised 8 July 1903). The mid 2018 demolition deadline will not be enforced. The traders on the Hockley Business Rark say that it 'has gone quiet' on the proposed redevelopment of the Business Park. However, the developer, Nordhus Properties have submitted a revised planning application on May 16th 2018. This matter is not closed. The risk to the building still remains. The planning permission for the Hockley Business Park redevelopment has been resubmitted. A decision on the application is pending.